Exploring Education 4 Edition This much-anticipated fourth edition of Exploring Education offers an alternative to traditional foundations texts by combining a point-of-view analysis with primary source readings. Pre- and in-service teachers will find a solid introduction to the foundations disciplines -- history, philosophy, politics, and sociology of education -- and their application to educational issues, including school organization and teaching, curriculum and pedagogic practices, education and inequality, and school reform and improvement. 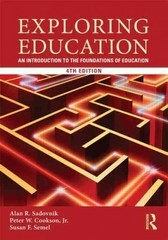 This edition features substantive updates, including the addition of discussion on the neo-liberal educational policy and recent debates about teacher evaluation, updated data and research, and new readings by leading researchers, such as Diane Ravitch, Robert Dreeben, and Helen F. Ladd.At a time when foundations of education are marginalized in many teacher education programs and teacher education reform pushes scripted approaches to curriculum and instruction, Exploring Education helps teachers to think critically about the "what" and "why" behind the most pressing issues in contemporary education.